Try googling “guitar” and “noise” and you’ll probably uncover more than a few articles on Neil Young. 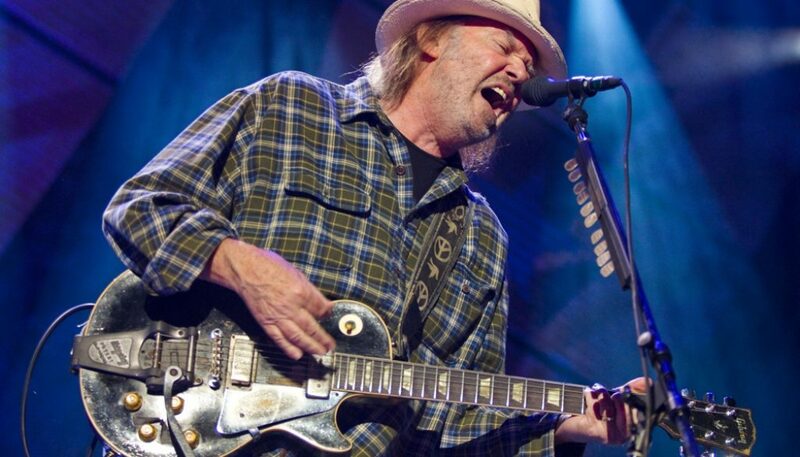 In a recent review, the writer said that to be a Neil Young fan you really have to be into the concept of Neil Young, because he is an artist who deliberately changes track trying to upset fan expectations. If you “get” what Neil is all about, you might end up liking just about everything he does, whether mellow acoustic music or raucous feedback and guitar noises. Born in Toronto, Neil Young began his music career in Winnipeg, Manitoba working in folk clubs where he crossed paths with the likes of Joni Mitchell, Randy Bachman and Stephen Stills. After a record deal with Motown fell through, he relocated to Los Angeles, and met up with Stephen Stills to form the band Buffalo Springfield. Although short-lived, the band scored a hit with the classic song For What It’s Worth. Young’s songwriting contribution to Buffalo Springfield included Expecting to Fly, Broken Arrow, I Am a Child, On the Way Home and Mr. Soul. He followed Buffalo Springfield with a series of solo albums, sometimes with the backing band Crazy Horse (three musicians whom Neil recruited from the band The Rockets). His second album, “Everybody Knows This is Nowhere,” opens with Cinnamon Girl and also features the lengthy jam tracks Down by the River and Cowgirl in the Sand. In 1969, Neil reunited briefly with Stephen Stills by joining Crosby, Stills and Nash. Rather than working as their sideman he forced the band to change their name. They appeared together as Crosby, Stills, Nash and Young at Woodstock in 1969 and began recording together as a quartet. Their album Déjà vu features Neil’s ballad Helpless. Neil then recorded and released a series of solo albums that heavily favored country-folk sensibilities. Harvest from 1971 includes some of his most famous songs, such as The Needle and the Damage Done and Heart of Gold. Neil felt that Heart of Gold was a song that put him smack in the middle of the road, and he took a characteristic sharp turn for what he called “the ditch.” He followed the hugely successful Harvest with darker sounding electric albums like Tonight’s The Night, On The Beach and Zuma (recorded with the re-formed Crazy Horse). For much of his career Neil has alternated between acoustic and electric based albums. The 80s saw a period of experimentation in guitar noise, rockabilly and electronic music. At one point, he was even sued by his own record company for making music that didn’t sound enough like “Neil Young”. He returned to the forefront of rock music in 1989 with Freedom, one of his strongest albums to date. In the 90s he would become known as the “godfather of grunge” for his distinctive electric style on albums like Ragged Glory and Sleeps with Angels. Fans of his lighter acoustic material were pleased with his returned to acoustic prominence during the unplugged fad of the 90s with Harvest Moon and Unplugged. In 2005 Neil had a near death experience due to a brain aneurysm. After recovering, he released his twenty-seventh studio album, Prairie Wind, which contains eight songs written prior to undergoing medical treatment. Oscar-winning director Jonathan Demme (The Silence of the Lambs) chronicled Neil’s two night performance in Nashville in the concert film Heart of Gold. This was the beginning of an accidental trilogy of films about Neil directed by Demme. Trunk Show followed in 2009 and features a performance from the “Chrome Dreams II” tour. The 2012 film Journeys visits Neil’s childhood home in Omemee, Ontario with the singer, interspersed with solo performances from Toronto’s Massey Hall. Since 2006, Neil has been sporadically releasing archival materials, including a sprawling 8-CD set known as The Archives Vol. 1 1963-1972, and a handful of concert recordings in the Archives Performance Series. In 2010 he closed both the Vancouver Winter Olympics and the final episode of The Tonight Show with Conan O’Brien with his classic “Long May You Run.” He continues to release new music at a pace that eclipses all of his peers. Fork In The Road (2009) is loosely based on his experiences converting a Lincoln Continental to run on alternative energy and driving it cross-country. He partnered with producer Daniel Lanois on 2010’s Le Noise. He released two new albums with Crazy Horse in 2012: Americana and Psychedelic Pill. In between touring Europe and North America, he released two more new albums in 2014: A Letter Home and Storytone. Even for an artist as mercurial as Neil, 2014 was a prolific year with many of his competing passions keeping him in the spotlight. His audio player company, Pono, raised over $6.2 million on Kickstarter. He completed his second book of memoirs called Special Deluxe. His first book of memoirs, Waging Heavy Peace, was published in 2013. He spent much of the year raising his voice against environmental issues such as fracking in the Gulf of Mexico and extracting oil from Canada’s tar sands in Alberta. In November, he had his first exhibition as a water color artist. He filed for divorce from his wife of 36 years, Pegi Young, the inspiration for some of his most enduring love songs, including “Such a Woman” and “Unknown Legend.” He also had a public feud with former band mate David Crosby, which has dashed any hopes fans may have for one more CSNY reunion. Who knows where Neil will go next? Wherever it is, we can be sure it will make a mighty sound. Probably a noise worth listening to. For those of you interested in making some real guitar noise, we have lessons on many of Neil Young’s most popular songs, complete with guitar tab and MP3 files. Neil Young’s work generally falls into one of two distinct styles: folky-acoustic rock (as in Harvest Moon, Old Man, and Heart of Gold), or feedback laden hard rock (Cinnamon Girl, Hey Hey, My My (Into The Black) and Rockin’ in the Free World). You will find several of these songs arranged here. Beginners will appreciate the simplicity of the two chord song For What It’s Worth. In our arrangement we use this old Buffalo Springfield classic to learn a new strumming technique and figure out how to get a cool percussive rhythm sound. Neil Young’s songs are relatively easy to learn yet still complicated enough to help you hone your skills. From 1979’s Rust Never Sleeps, Hey Hey, My My (or is it My My, Hey Hey?) can be played on both the electric and acoustic. Neil Young’s Heart of Gold is a classic guitar-harmonica song. Take a four chord song, add a few simple touches, and you’ll be amazed how cool you sound! Old Man is a fun and easy song from Harvest that you can learn in practically no time at all and still spend ages on practicing in order to get the kinds of sounds you want. Songs like this never get old. Harvest Moon is a classic Neil Young tune. Have fun learning something about chord voicing, strumming, Drop D tuning and even a little ear training on the side. This lesson includes a bonus MP3 for all you twelve-string guitar players. The Neil Young classic Like A Hurricane lends itself nicely to learning how to integrate a song’s melody into your strumming. In this lesson we’ll also work on arpeggios and partial chord picking. The Needle and the Damage Done is one of Neil Young’s best loved acoustic songs. On the surface, there’s not an awful lot to this short, yet powerfully moving song. Because of the structure of the song, it’s very much up to the single guitarist to make this an interesting arrangement. And that’s what we’ll do with an arrangement that is interesting, challenging and also gives us some things that we can use in our every day guitar playing. Here’s a short lesson on After The Gold Rush that uses the chord melody approach to come up with a nice song arrangement that you can play either as a chord melody or as a single guitar accompaniment for a singer (or yourself). Let’s take Cinnamon Girl to look at alternate tunings and a song with an instantly recognizable and catchy riff.